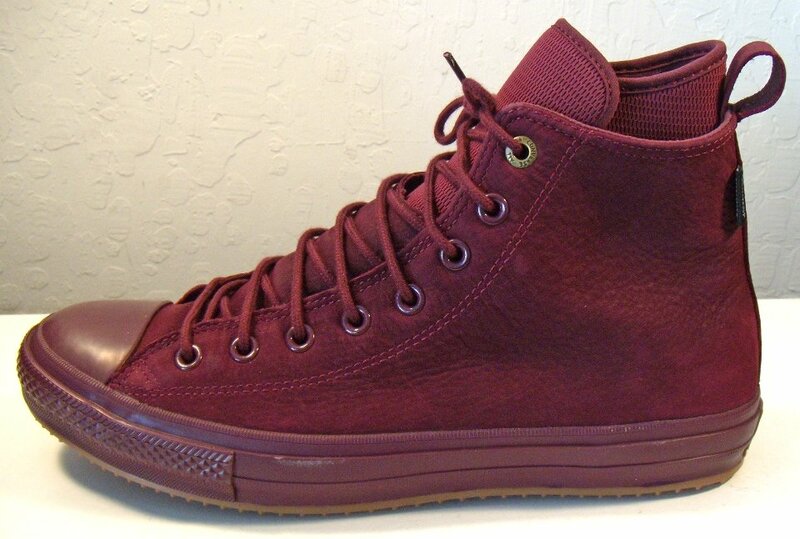 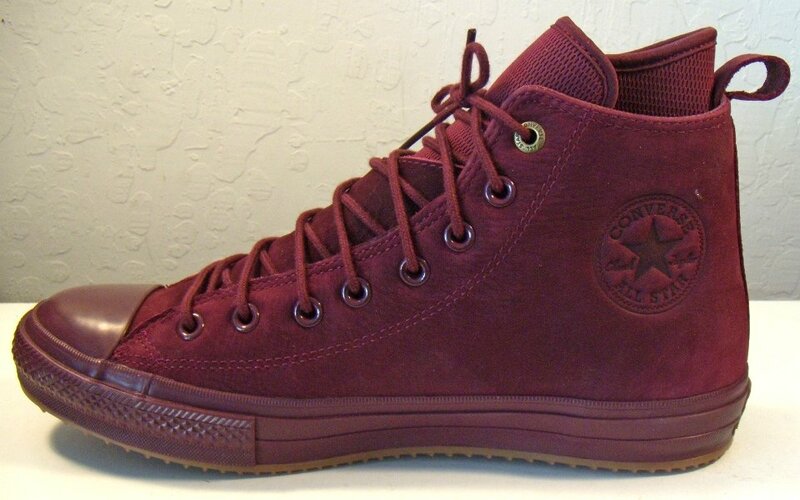 Photo gallery of a new pair of dark Sangria Waterproof Chuck Taylor Boots. 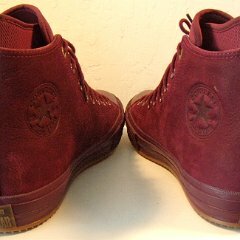 1 Waterproof Sangria Chuck Taylor Boots Inside patch view of a right sangria waterproof Chuck Taylor boot. 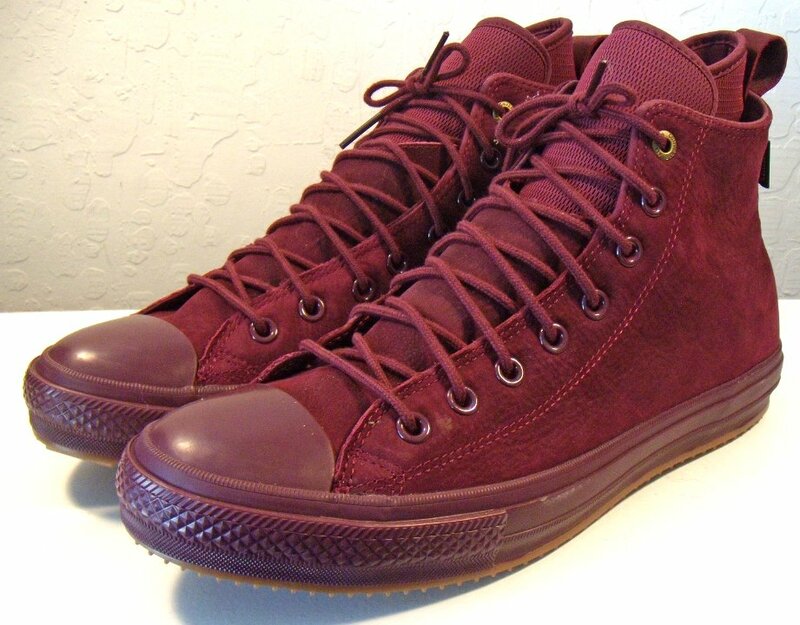 2 Waterproof Sangria Chuck Taylor Bootsts Outside view of a right sangria waterproof Chuck Taylor boot. 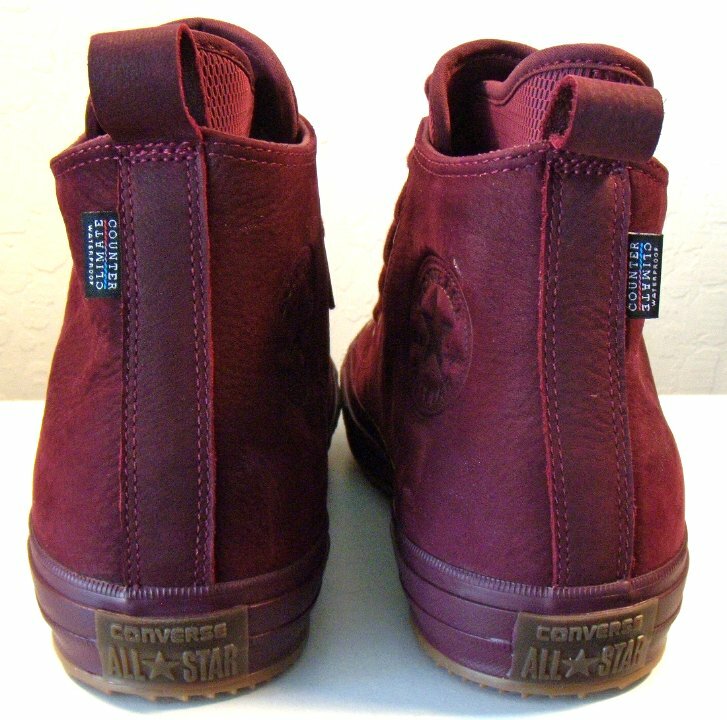 3 Waterproof Sangria Chuck Taylor Boots Inside patch view of a left sangria waterproof Chuck Taylor boot. 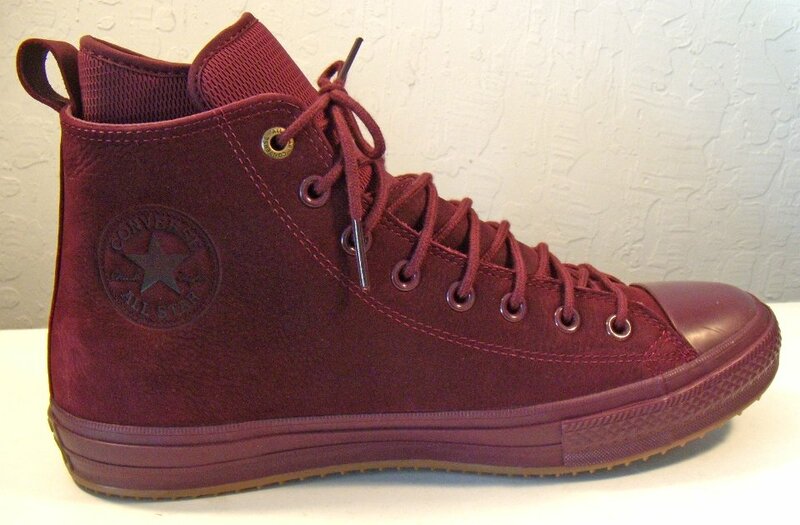 4 Waterproof Sangria Chuck Taylor Boots Outside view of a left sangria waterproof Chuck Taylor boot. 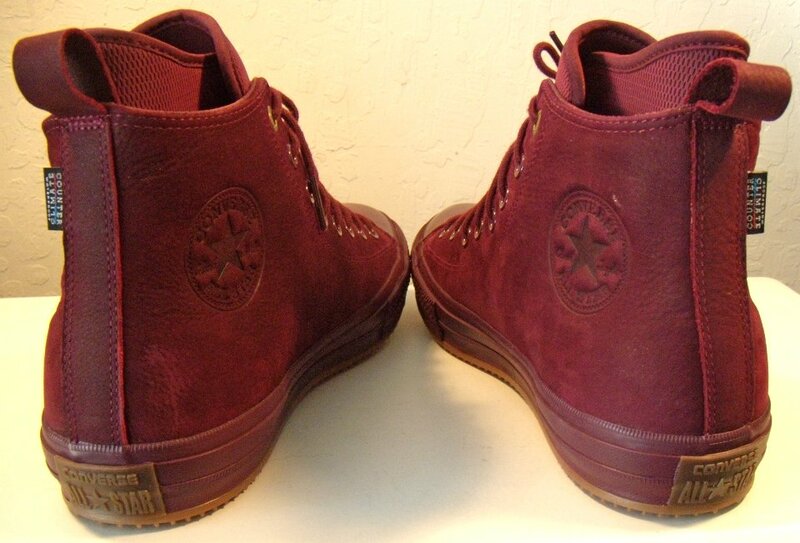 5 Waterproof Sangria Chuck Taylor Boots Rear view of sangria waterproof Chuck Taylor boots. 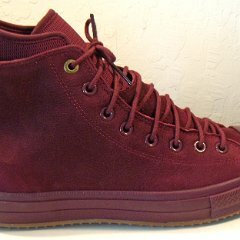 6 Waterproof Sangria Chuck Taylor Boots Angled rear view of sangria waterproof Chuck Taylor boots. 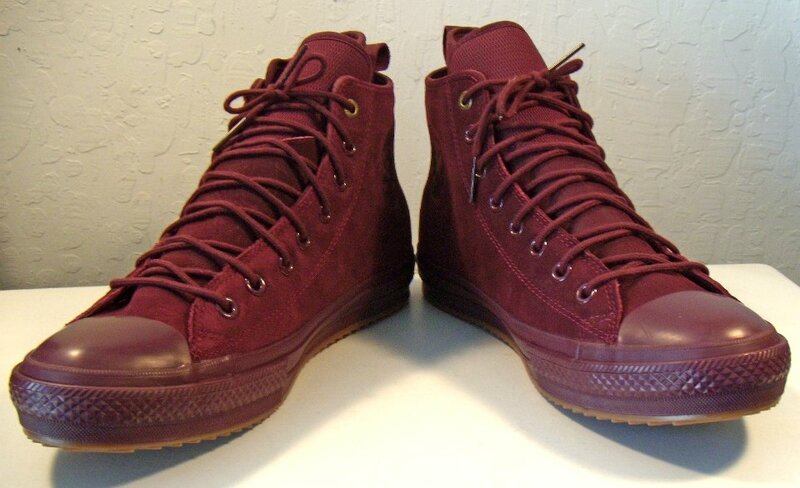 7 Waterproof Sangria Chuck Taylor Boots Angled side view of sangria waterproof Chuck Taylor boots. 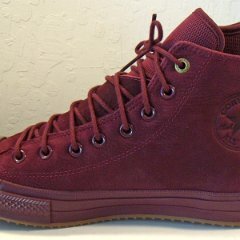 8 Waterproof Sangria Chuck Taylor Boots Front view of sangria waterproof Chuck Taylor boots. 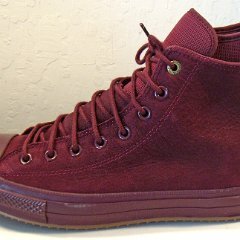 9 Waterproof Sangria Chuck Taylor Boots Angled front view of sangria waterproof Chuck Taylor boots. 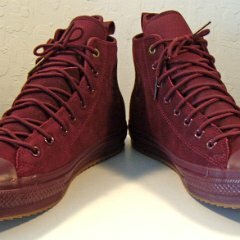 10 Waterproof Sangria Chuck Taylor Boots Top view of sangria waterproof Chuck Taylor boots. 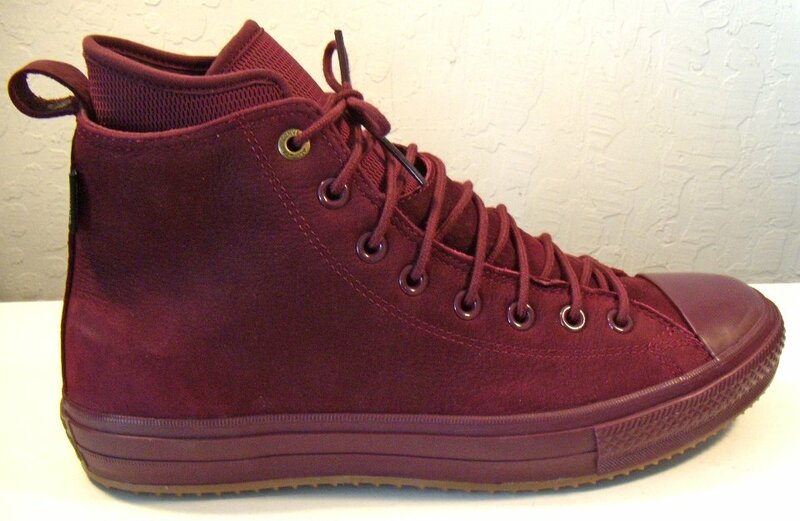 11 Waterproof Sangria Chuck Taylor Boots Outer sole views of sangria waterproof Chuck Taylor boots. 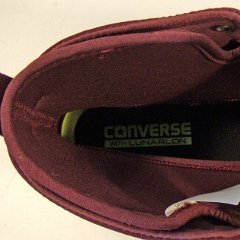 12 Waterproof Sangria Chuck Taylor Boots Insole closeup view. 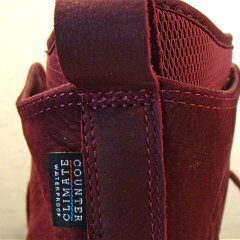 13 Waterproof Sangria Chuck Taylor Boots Closeup of the Counter Climate waterproof tag and the rear of the inner lining. 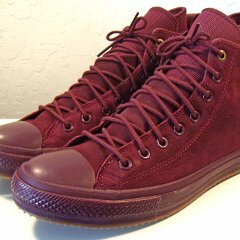 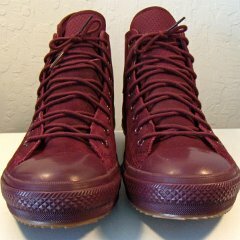 Dark Sangria Chuck Taylor All Star Waterproof boots are a seasonal issue for Fall, 2017. The shoes feature nubuck uppers with an inner layer of extra protection. 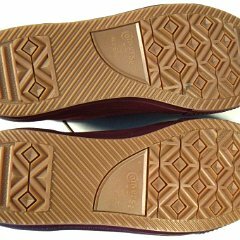 They are treated with a counter climate process that keeps water out. 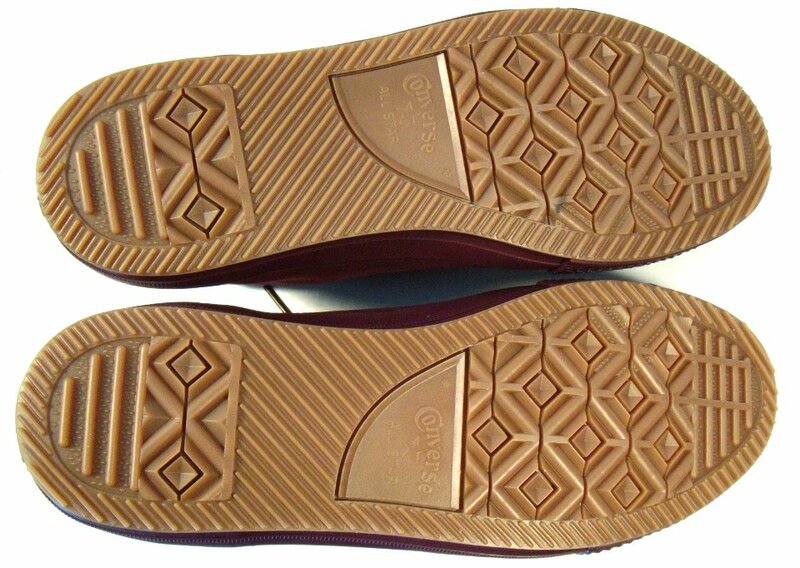 They have extra thick outer soles to help prevent slipping when walking in the rain. 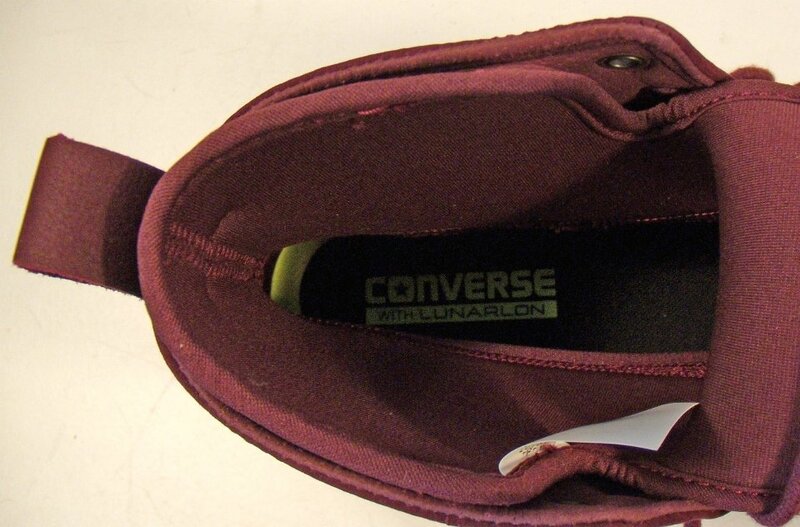 The insole is Lunarlon combined with the inner bootie around your ankles. 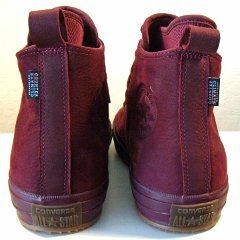 They have built in hooks on the back spines so you can hang them to dry out if they get really wet on the outside. 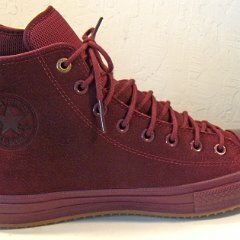 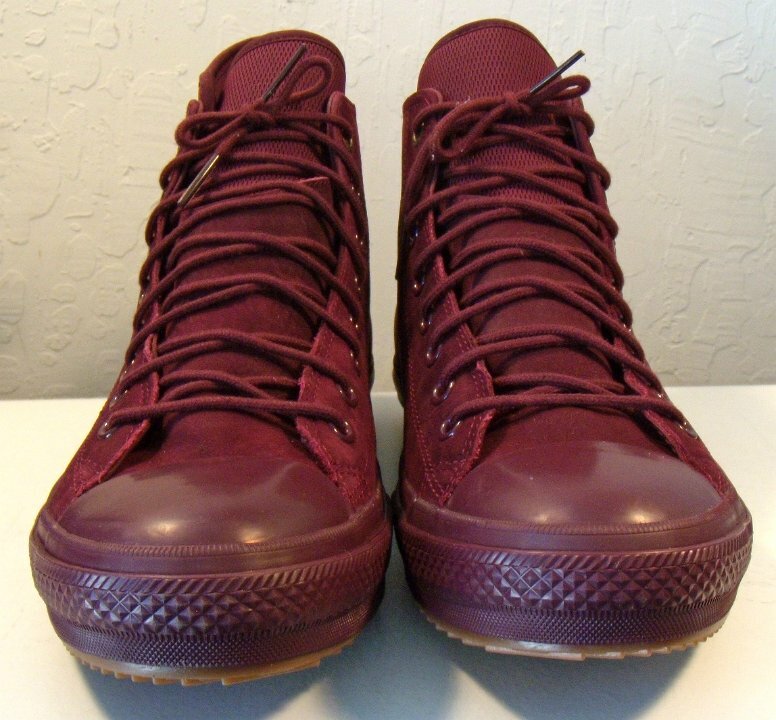 Their color design is monochrome on this and the black model, and like the Chuck Taylor II for the gray and brown models. 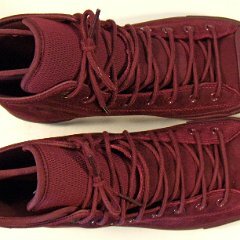 The matching shoelaces are narrow round. 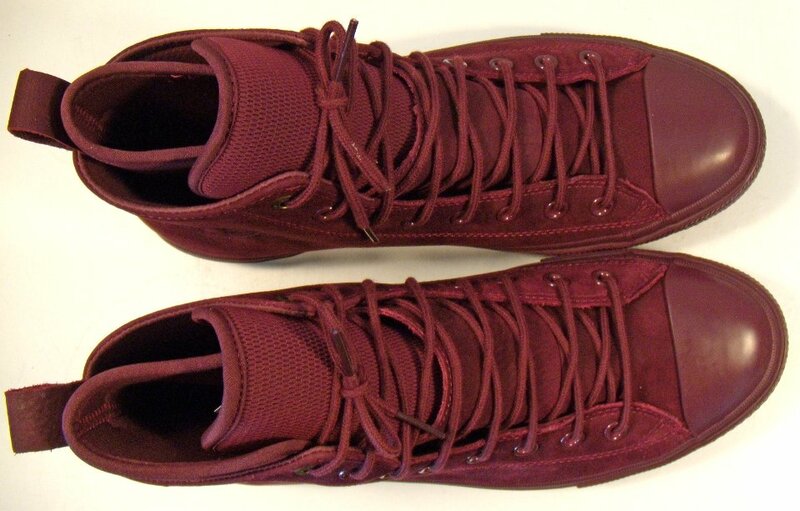 Both the ankle patch and the ankle patch are embossed and blended in to the shoes.